I was surprised at the response we received from the last E-alert I sent out on probiotics. It apparently touched a core in many of you. Because of this response I thought that I might add a few more points to this topic. It is estimated that about 70% of our immune system resides in the lymphatic tissue of the G.I. tract. Dr. David Williams very succinctly explained, “When you have a break in the mucosal barrier, toxins and undigested foods can more readily enter the blood stream. This is often the beginning of food allergies and systemic toxicity problems” which results in multiple signs and symptoms like headache, fatigue, brain fog, classical allergy with hives, asthma, etc, but also just not feeling well. Stress of all kinds, as well as real physical trauma, cause major insults to our bodies but recent research shows that providing abundant Probiotics to our intestines can literally prevent or reduce this trauma. A study in Greece with trauma patients showed that treatment with probiotics reduced inflammation and risk of pneumonia and blood born infections as well as length of stay in intensive care and time spent on mechanical ventilation. An animal study revealed that when newborn animals were separated from their mothers they developed serious illness or disease. 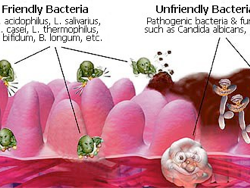 However, when pre-treated with adequate Probiotics no damage to the young animals occurred. These probiotics are anti-inflammatory, anti-toxin, anti-allergy, anti-candida, and powerful boosters over all to our immune system. Remember, if you have taken an antibiotic it can take you over 2 years re-grow your normal flora. Supplementation here is especially critical. Click here if you would like to order or get more information.